Last Tuesday April 3, 2018, we had an incredible experience that not only taught us a lot, but also left us a with new story to tell. Loreto has a visit from the Doctor in Ecology and Evolutionary Biology at the University of California in Santa Cruz California, Winifred Frick Ph.D. and her husband Dr. Paul Heady, both experts in the study and monitoring of different species of bats in each of the islands and islets along the Gulf of California. On this occasion, Winifred and her husband Paul went on to monitor the Pallid Bats, an endemic species from Baja California Sur and monitored this time on Coronado Island in the municipality of Loreto, located within the Loreto Bay National Marine Park. The scientific adventure began aboard two boats at 6:30 pm on Wednesday. We embarked on the first Panga from “La Dársena”, accompanied by the admired and talented professional photographer Richard Jackson, the charismatic Winifred´s uncle, Mr. Quentin Frick, whose jokes kept us laughing the entire trip! He also taught us a lot about bats. His collaboration with Winifred and Paul has brought him to Loreto 14 times in the last 3 years, and he has become very knowledgeable about the topic. We were also accompanied by a couple of adventurers, the writer and photographer John R. Gentile and Katie Iverson, his wife, who is a painter. They told us about their adventures around the world and about their future projects. We can’t wait for your return next year and hear more about your trips! The second Panga sailed with the renowned Doctors Paul and Winifred. Along with them came Darwin, their enthusiastic son, with whom we engaged in very funny conversations. We also shared the trip with Gage Daytone, who is the Administrative Director of the Santa Cruz Natural Reserve of the University of California (UCSC), and his daughter. Both spoke an excellent Spanish and were always attentive and participative throughout the entire survey. Our friends from the “Bahía de Loreto National Park” were also represented thanks to the participation of one of their biologists and environmental educators, Mariana Salgado. Incredible people! Only 20 minutes sailing the Gulf of California were enough to get the first call to disembark. Coronado Island always offer an overwhelming view. We could behold its giant rocks, colored in several shades of gray, brown and white. We sailed alongside a rocky area which surface shimmered under the evening light. The rocky formations once were streams of lava, which emerged from the bottom of the Gulf of California millions of years ago, and rapidly solidified as it reached the surface. It’s worth mentioning that this island is an old volcano that is currently inactive. Just before nightfall we set foot on the island. Out first step was searching for these small flying mammals. We found them in small caves and narrow crevices, from where they flew out and started to ascend more and more, reaching an altitude of approximately 10 meters. After the show, the scientific team gathered to begin processing some data. We could then learn about the different equipment and monitoring techniques. Winifred was so kind to show how these devices worked and helped us to understand the readings that each of them recorded. All this happened while the night was closing around the island. Time to watch our steps over the slippery rocks, but also keep and eye out for these small fishing mammals that were in the middle of all the action. But finally, In that time where you see that peculiar navy blue on the horizon, where you can only see the shadows of people, right between the point where the sun hides and the night is about to fall, we could start to hear those sounds, like those uttered by small mice, only a bit more acute. At that time the experts began to work with the digital equipment in order to record movements and high frequency sound emitted by the bats. At the same time, Richard began to shoot about with his camera. Aiming towards a small cave on the top of a rock about 2 meters high, right there, we found the first sighting and therefore the first record. But nobody would have thought that it was only the beginning of an incredible and frantic race for night fishing, where many of these marvelous mammals participated. It was fascinating to see the bats fishing in the dark. They were obviously lighted up by the experts and their devices, for only this way they are able to observe their fishing behavior. During their flight, bats left luminous tracks. They often start from the cave entrance, glide along the surface of the water, and eventually catch their prey in a quick but somehow delicate manner. According to the doctors, bats send echo localization pulses in order to detect fish breaking the surface of the water. At that point the bat would stick its feet 10 to 20 cm deep, luckily managing to capture its prey with its big nails. Amazing! We carried on with the survey for about 40 minutes, amazed by this magical combination of science and pure nature. At the end, it was a very productive session, full of new learning. 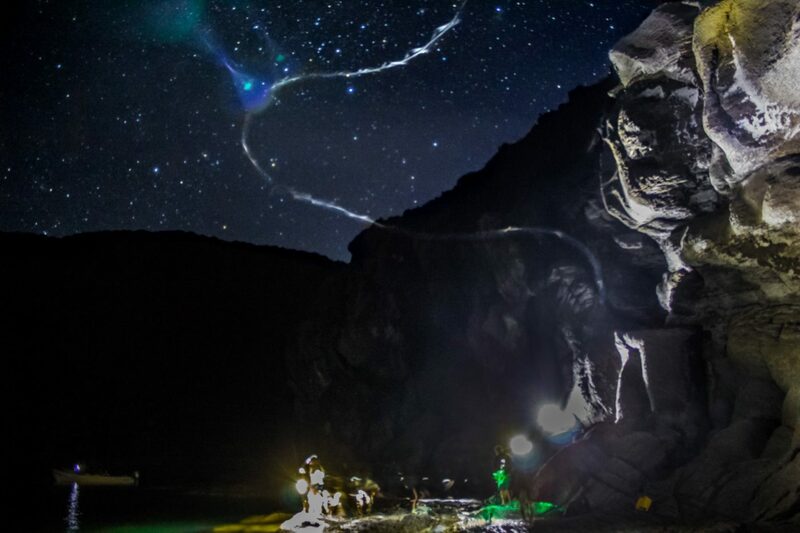 Pallid Bats were great, but there, amidst the darkness, between gigantic rocks we also got to witness another nocturnal phenomenon: planktonic bioluminescence. Picture this: dozens of bats flying about performing their crazy maneuvers in the air, while in the sea Mother Nature was giving us a surprising sample of natural life with an engrossing light show. We didn’t miss the chance of getting Winifred and Paul to teach us once another great scientific lesson. There is no doubt that this type of events provides a lot of scientific information and will help us to understand more about the nature around us. People like Winifred and Paul help us to realize that out there, in places that we do not know, there are all sorts of other animals and shocking behaviors. Some people won’t take the hassle to go out to find them. Others in the other hand, will discover a world full of wonders ready to be unveiled. At the moment of writing this we feel still excited! We are eager to see Winifred and her team back to Loreto soon, and to participate once again on these monitoring surveys, if we are so lucky to get a spot again! Thanks a lot Winifred, Paul, Darwin, Quentin, Gage, Richard, John, Katie and Mariana, for making this possible. If you want to know more about the great work of Winifred, you can visit this page.